The Ice Castles have arrived in Breckenridge for the 2013/2014 season and will open next week, December 26, 2013. Read more about how they’re made, the unique features coming this season, and how you can win tickets to see them yourself. The ice creators set up an icicle farm with pipes and water dripping constantly just a few yards beyond the structures themesleves. The farm creates about 10,000 icicles per day and the finished products are hauled up, by sled in carpet bags, to the castles to be attached throughout. Yes, tons of the icicles break in the process. The icicles are attached, by hand, using a paste of snow and water. The more delicate and tricky sculptures, such as arches spanning overhead, are created using this process. The castles have LED lights throughout that will illuminate the structures at night. You’ll notice the ice is a clean blue during the day. This is not because of the lights but because the compressed water means there’s no air to create the lighter white we’re all used to. The remainder of the structures are created using pipes and a complex irrigation system that is constantly spraying water. As the structures grow, more vertical piping is added to spray over the castles. The ice is entirely weight-bearing to allow the crew to climb up. Red said something like 4 inches of ice can support a person and 12 inches can hold a vehicle and you can see for yourself, some of these walls are many feet thick. So far the team of 5 – 10 have spent about a month building what we can see now. The crew will keep working, full time, through the entire season. When its time for the castles to come down, they actually demolish the structures and water them down. Otherwise, the team says the sheer density of the castles could allow them to say in place all the way through the summer. If it’s not clear, there’s no underlying infrastructure (no supporting beams or initial walls), the structures are made entirely of ice forming on top of more ice. Given that, approximately 7 millions gallons of water will be used to build and maintain the ice castles. The water is always flowing and the sprinklers are set to run all night (in case you think you can sneak in, you’d be soaked within seconds). As the water falls you’ll see plenty of unique formations: in some cases icicles grow upwards, some water drips down and the wind blows it sideways to twist the path in a spiral, and you’ll likely see a bunch of bubble-like surfaces where a water drop falls and creates a round bulb. The team intentionally builds from the outside walls towards the inner, taller surfaces allowing for a good distance between visitors and the taller, more complex and fragile structures (for safety reasons). Right now the team is cutting out all the pathways, creating the maze and cleaning up the floor to make it safe and walkable for visitors. Over the coming months you’ll be able to watch the entire structure and features evolve. Hopefully by February a second floor with a ramp will wrap around the middle of the structure. A tunnel slide will then lead down from the second floor. Plenty of arches and complex ceilings will sit high above visitors. A pair of thrones are being erected for visitors to sit and take photos on. Even a tall fire pit is planned to be built which will make for an excellent fire-and-ice scene. The world’s tallest ice structure is 52 feet or so and the team is also aiming to break that record this season in Breck. Fingers crossed the days and nights stay cool to allow this to happen! You’ll find the Ice Castles in Breckenridge off Adams road, just west of Main Street and behind the Riverwalk center right off of the bus line. It’s in the park adjacent to the parking lot where the annual ice sculpture competition happens (talk about a lot of ice this year!). Are these the same ice castles from this video? I’ve always wanted to visit! Yup! That was filmed two years ago when they came to Silverthorne. My in-laws are coming for Christmas and I am always looking for new stuff to do with them. This looks perfect! And for the record, this has nothing, and I mean NOTHING to do with leaving my in-laws out in the cold. It’s a bunch of fun with plenty of interesting photo opportunities. 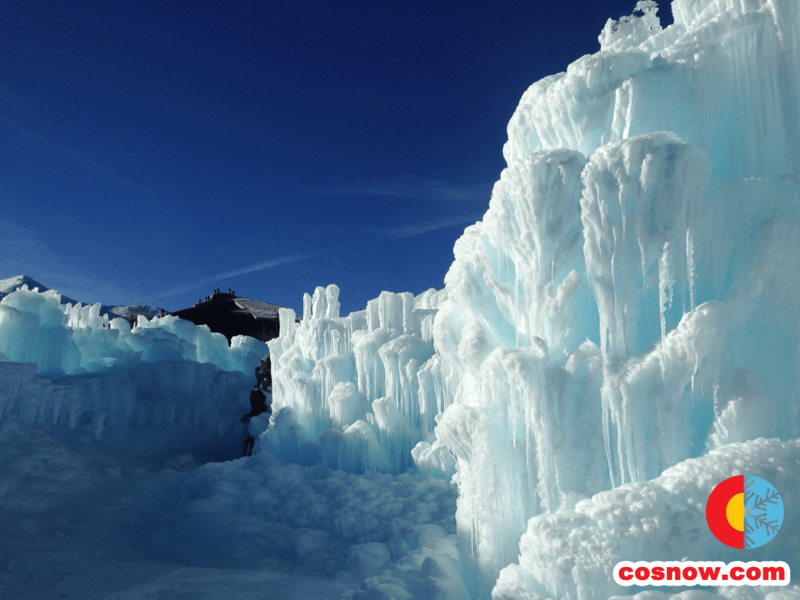 We went to see your ice castles in Silverthorne and loved it!. We told everyone we know about it and sent pics to our families in Florida. It was amazing! We have a picture of ourselves hanging in our hallway with the Ice Castle. Lord willing, we will go and see them again in Breckenridge. Thanks for the work you do. It is very much worth seeing.. Must see during the day and the night. It changes in appearance!! WOW we loved it! !